A total of 49 records matched your search. 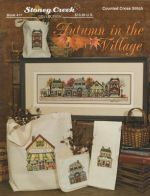 Autumn in the Village by Stoney Creek is the third in the series of Village designs stitched on 14ct or 28ct Ivory with a stitch count of 240w x 72h. DMC or Anchor floss is used with 1 Caron Collection Waterlilies. 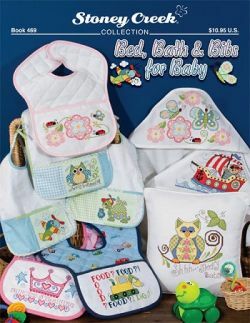 Bed, Bath and Bibs for Baby from Stoney Creek Collection is a delightful collection of items for the sweet one in your life. This book contains 9 patterns, bibs and bath towels can be ordered at the shop. All patterns use DMC/Anchor floss. 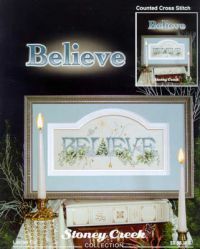 Believe from Stoney Creek Collection is stitched on 14ct or 28ct Antique White with a stitch count of 172w x 82h using Anchor/DMC floss, Glisson Gloss Blending Filament, Mill Hill Beads and charms. 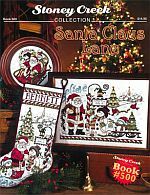 Best of Stoney Creek Stockings I from Stoney Creek contains 4 stocking patterns stitched on 14 count or 28 count fabric of your choice using DMC or Anchor floss as well as Rainbow Gallery Glisson Gloss Blending threads. 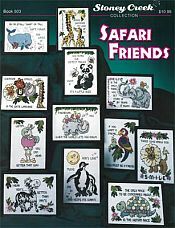 Alphabets are provided for personalizations. 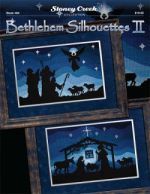 Bethlehem Silhouettes II from Stoney Creek Collection can be a companion piece for the previously released Bethlehem Silhouettes. The Nativity has a stitch count of 200w x 110h, and The Tidings of Great Joy has a stitch count of 210w x 125h. Both patterns are stitched on 14/28 count Black. DMC/Anchor threads are used. 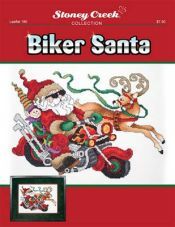 Biker Santa from Stone Creek Collection is stitched on 14/28 White with a stitch count of 163w x 119h using DMC/Anchor floss and 1 Rainbow Gallery Glisson Gloss Blending Thread. 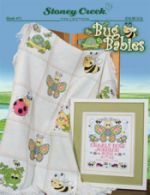 Bug Babies from Stoney Creek Designs is stitched on a 14ct Rainbow Nursery Time Afghan. There are 13 patterns with design size of 5.25" x 5.25" that can be stitched alone or on the afghan. The afghan cost is $34.95. 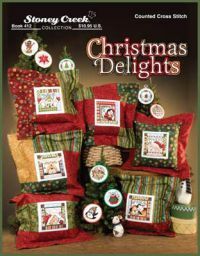 Christmas Delights from Stoney Creek is a collection of 13 patterns on 28 count White Pillow Sham insert or can be stitched on 14 count or 28 count White for framing with stitch counts of 39w x 41h to 70w c 70h using DMC or Anchor floss. Charms, buttons and pillow shams are available from Stoney Creek. 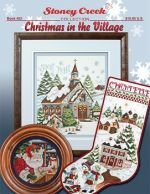 Christmas in the Village from Stoney Creek Collections has 3 patterns, one stocking, a Santa and a Church. Stitch counts range from 104w x 104h to 148w x 248h, various fabrics are used with 14ct or 28ct as suitable fabrics. DMC/Anchor, Rainbow GAllery Glisson Gloss, Kreinik Metallic Thread,Mill Hill Bead, Mill Hill Treasure, Color Variations being used. 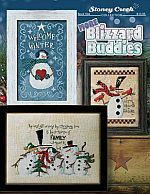 Christmas Joy from Stoney Creek Collection contains 3 patterns, a Santa Christmas Plate, Snowman and Puppy Stocking and Snowman Christmas Joy using 14 count or 28 count fabric using DMC or Anchor floss. Stoney Creek buttons are available. 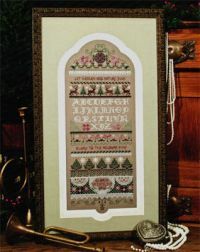 Christmas Sampler from Stoney Creek Collection is stitched on 14ct or 28ct Summer Khakl with a stitch count of 99w x 263h using Anchor/DMC threads, 4 Sampler Threads and 2 Glisson Gloss Blending threads, charms and Mill Hill beads add a 'Christmasy touch'. Specialty stitches are included in the pattern, with stitch diagrams included. 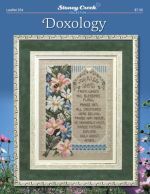 Doxology from the Stoney Creek Collection is stitched on 14/28ct Light Taupe or a fabric of your choice with a stitch count of 104w x 152h using DMC or Anchor floss with a #12 Pearl Cotton also used and one Rainbow Gallery Glisson Gloss. Fish City from Stoney Creek Collection is stitched on 14ct or 28ct white with a stitch count of 406w x 293h using Anchor/DMC threads. 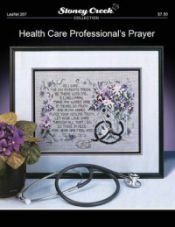 Health Care Professional's Prayer from Stoney Creek Collection is stitched on 14/28ct Pearl Gray with a stitch count of 145w x 104h using DMC/Anchor floss with 1 Rainbow Gallery Glisson Gloss Blending Thread. 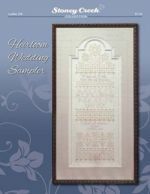 Heirloom Wedding Sampler from Stoney Creek Collection is stitched on 14/28ct White with a stitch count of 85w x 257h using Caron Collection fibers, DMC or Anchor floss and Mill Hill beads. 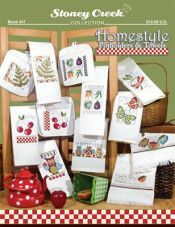 Homestyle Potholders & Towels from Stoney Creek Collection has 12 designs which fit on Showcase Huck Towels and KitchenMates potholders. DMC floss and DMC Color Variations are used. Hope and Joy from Stoney Creek Collection is stitched on 14ct or 28ct Antique White, with 2 patterns for the Snowpeople and the 2 ornaments stitched on 14ct or 28ct White Opalescent. Rainbow Gallery Glissongloss is used with DMC Color Variations and DMC or Anchor floss. 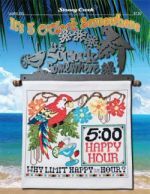 It's 5 o'clock Somewhere from Stoney Creek Collections is stitched on 14/28ct White with a stitch count of 155w x 135h using Weeks Dye Works, DMC and Anchor. A button from Stoney Creek is available. 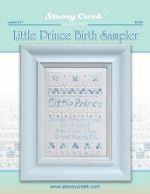 Little Prince Birth Sampler from Stoney Creek Collection is stitched on 14/28 count White with a stitched count of 59w x 88h using one Pearl Cotton #8, DMC floss and DMC Color Variations. 3 different Mill Hill Beads are also used to adorn this sampler. An alphabet is provided for personalization. 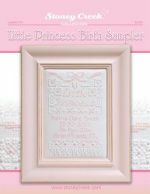 Little Princess Birth Sampler from Stoney Creek Collection is stitched on 14/28 count White using 1 Pearl Cotton #8, DMC floss and DMC Color Variations. 3 Mill Hill beads are used to enhance this sampler. An alphabet is provided to personalize the sampler. 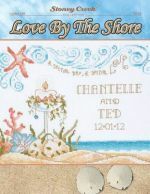 Love By The Shore from Stoney Creek Collection is stitched on 14/28ct White Opalescent with a stitch count of 125w x 101h using 2 colors of DMC Color Variations, 2 Rainbow Glisson Gloss Blending Thread and DMCor Anchor floss. 1 Mill Hill Treasure and 1 color of Mill Hill Beads are used. More Blizzard Buddies from Stoney Creek Collections contains 3 patterns usually hand-dyed fabric from Picture This Plus with stitch counts ranging from 84w x 114h to 167w x 131h .The patterns use DMC/Anchor Floss, Weeksy Dye Works, Rainbow Gallery Glissen Gloss Blending Thread and buttons available from Stoney Creek. 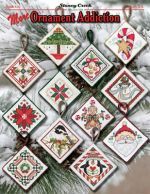 More Ornament Addiction from the Stoney Creek Collection contains an even dozen ornament patterns with stitch counts of 43w x 43h stitched on 14/28count white. Anchor or DMC floss are used with Rainbow Blending Filaments, Color Variations and Beads used to adorn these charming ornaments. Get started now for Christmas. Mrs. Claus Tropical Christmas from Stoney Creek Collection is stitched on 28 count Clear Sky from Stoney Creek, or a 14 count or 28 count fabric of your choice. Patterns for a stocking and 6 ornaments are included in the book. DMC/ Anchor floss is used with some DMC Color Variations. Stoney Creek buttons are available. 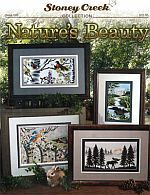 Nature's Beauty from Stoney Creek Collection contains 4 patterns stitched on hand-dyed fabrics or fabrics of your choice with stitch counts ranging from 81w x 136h to 155w x 119h using DMC/Anchor floss, Weeks Dye Works hand-dyed fibers and buttons from Stoney Creek. 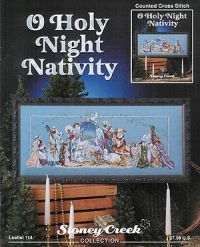 O Holy Night Nativity from Stoney Creek Collection is stitched on 28 Blue Wing or a 14ct blue fabric of your choice with a stitch count of 352w x 130h using Anchor/DMC floss, Glisson Gloss Blending Filament and Mill Hill Beads. 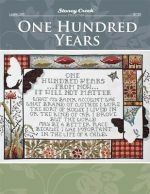 One Hundred Year from Stoney Creek Collection is stitched on 14/28ct Antique White with a design size of 13.5" x 9" using Weeks Dye Works, DMC and Anchor. 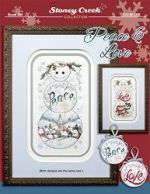 Peace and Love from Stoney Creek Collection is stitched on 14ct or 28ct Antique White, with 2 patterns for the Snowpeople and the 2 ornaments stitched on 14ct or 28ct White Opalescent. Rainbow Gallery Glissongloss is used with DMC Color Variations and DMC or Anchor floss. 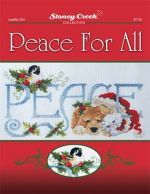 Peace for All from Stoney Creek Collections is stitched on 18ct White or a fabric of your choice with a stitch count of 166w x 86 h using DMC/Anchor, Rainbow Gallery Glisson Gloss. 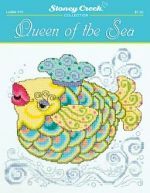 Queen of the Sea from the Stoney Creek Collection is stitched on 14/28 count White with a stitch count of 108w x 106h using DMC floss and 2 DMC Color Variations. 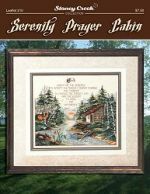 Serenity Prayer Cabin from the Stoney Creek Collection is stitched on 14/28ct Potato or a fabric of your choice with a stitch count of 174w x 147h using DMC/Anchor floss with one Rainbow Gallery Glissongloss blending thread, a DMC Light Effects floss and Rainbow Gallery Tweed. 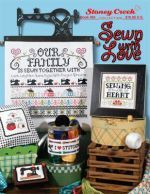 Sewn with Love from the Stoney Creek Collection has 5 patterns stitched on 14/28count White using DMC/Anchor floss, some Blending Filaments and Kreinik Japan threads. 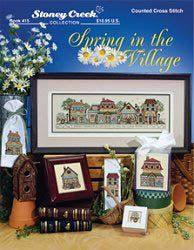 Spring in the Village by Stoney Creek is the first in the series of Village designs stitched on 14ct or 28ct Ivory with a stitch count of 240w x 72h. DMC or Anchor floss is used with 1 Caron Collection Waterlilies. 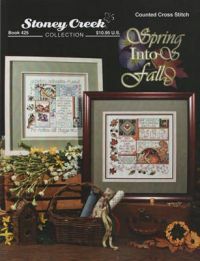 Spring into Fall by Stoney Creek has 2 designs stitched on 14ct or 28ct Antique White with stitch counts of 128w x 128h. Both use DMC/Anchor floss. 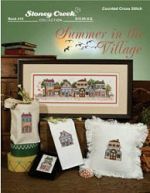 Summer in the Village by Stoney Creek is the second in the series of Village designs stitched on 14ct or 28ct Ivory with a stitch count of 240w x 72h. DMC or Anchor floss is used with 1 Caron Collection Waterlilies. 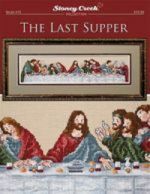 The Last Supper from Stoney Creek Collections is stitched on 14/28ct Clay with a stitch count of 315w x 70 using DMC floss. 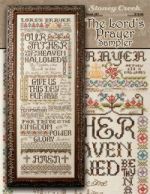 The Lord's Prayer Sampler from Stoney Creek Collection is stitched on 14/28ct Lambswool with a stitch count of 129w x 390h using DMC/Anchor floss with 2 DMC Color Variations. 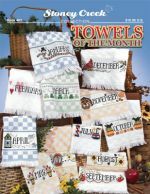 Towels of the Month from they Stoney Creek Colletion features 14ct Verona towels from STS Crafts, DMC/Anchor Floss, some DMC Color Variations and Weeks Dye Works hand-dyed fibers are used. 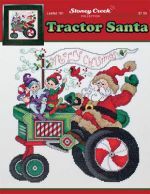 Tractor Santa from the Stoney Creek Collection is stitched on 14/28ct Antique White with a stitch count of 126w x 129h using DMC/Anchor floss with one Rainbow Gallery Glissongloss blending thread. 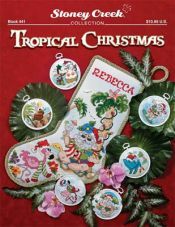 Tropical Christmas from Stoney Creek Collection contains the design for the Christmas stocking as well as for 6 festive tropical ornaments. 14/28ct fabric is used, all designs use DMC/Anchor threads with DMC Color Variations and buttons from Stoney Creek. Finishing instructions are included. 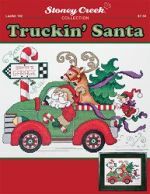 Truckin' Santa from the Stoney Creek Collection is stitched on 14/28 count Antique White with a stitch count of 159w x 122h using DMC floss, 1 Glisson Gloss Blending Thread and 1 Colorwash Silk Thread. 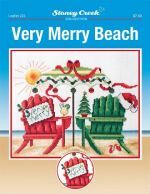 Very Merry Beach from Stoney Creek Collections is stitched on 18ct white or a fabric of your choise with a stitch count of 126w x 95h using DMC/Anchor, 1 Rainbow Gallery Glisson Gloss, 1 Kreinik Metallic thread and 2 Stoney Creek Buttons. 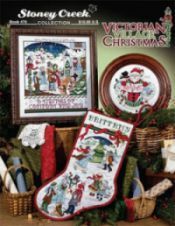 Victorian Village Christmas from Stoney Creek Collection contains 3 patterns to celebrate the holidays including a Christmas stocking. DMC floss, Color Variations, Glissengloss metallic threads are used with Mill Hill Beads and Stoney Creek buttons. 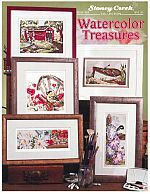 Watercolor Treasures from the Stoney Creek Collection contains 5 patterns stitched on 14/28 count Antique white or various hand-dyed fabrics, you may use a fabric of your choice with stitch counts ranging from 65w x 166h to 158w x 115h. The patterns use DMC/Anchor floss, DMC Color Variations, Weeks Dye Works hand-dyed fibers and use Stoney Creek buttons. 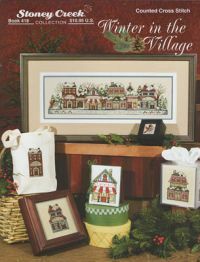 Winter in the Village by Stoney Creek is the last in the series of Village designs stitched on 14ct or 28ct Ivory with a stitch count of 240w x 72h. DMC or Anchor floss is used with 1 Caron Collection Waterlilies. 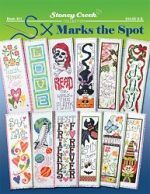 X Marks the Spot from the Stoney Creek Collection contains 12 bookmarks, designs to meet everyones tastes. The bookmarks are stitched on 14 count bookmarks using DMC floss, Sampler hand-dyed fibers and Glisson Gloss Blending threads.